What is the climate like in Morocco? The climate in Morocco is divided into two. In the north and north-west you’ll find a Mediterranean climate. In the south and south-east you’ll find a continental climate due to influences from the Sahara. Between the two climate zones is the High Atlas mountain range, where the high altitudes bring a different climate with it all together. The higher the mountains, the colder and rainier it becomes. Above 1,000 metres, you’ll even find snow in the Atlas Mountains during the winter months. 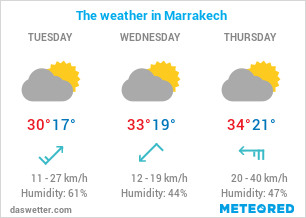 Meanwhile in the lower altitudes in places such as Marrakech, you’ll find the weather is a lot warmer and drier. Temperatures can easily exceed 36°C during the summer months of July and August. The further south you go, the drier and hotter the climate becomes. In the Sahara regions south of the Atlas Mountains, you’ll find sweltering desert climates with little to no rain at all. The Mediterranean climates in coastal regions in the north and north-west feature sunny and dry summers as well as mild weather in the winter. The same also applies to Marrakech, although due to its semi-arid climate the temperatures are higher on average – temperatures can reach higher than 30°C. In order to find the best time to travel to Morocco, it really depends on which place you’re going to. So that’s why I’ve looked a different regions all over the country to help you decide when to go! You’ll find comprehensive stats and helpful tables as well as recommendations on when to go to Marrakech, Rabat and the West Sahara. When is the best time to visit Morocco’s coastal regions? When is the best time to visit Marrakech and the inland region? When is the best time to visit the West Sahara in southern Morocco? Generally speaking, the best time to visit Morocco no matter where you go is spring and autumn. In the months of April, May, October and November, the climates are comfortable across the country and aren’t too hot. For the coastal regions in the north and north-west, the summer months are also a good shout when it comes to a holiday. Warm temperatures hovering at around 26 – 27°C are perfect for a beach holiday. If you want to do a tour around Morocco or just visit the city of Marrakech, then the time between September and May would be best for this. You’re best avoiding the summer months when travelling further inland as the climate is very hot and very arid – for some it might be unbearable. If you’re heading to the territory of the West Sahara, you’ll come across a hot desert climate, where summers are absolutely blazing. If you’re travelling through any deserts in Morocco then the autumn, winter and even spring months are best for this, just so you’re saved from the blistering highs. The coastal area of the West Sahara is somewhat milder, so the best time to visit here is some time between April and November. If you’re setting off for an adventure to the Atlas Mountains, then the months of March, May, October and November are best for this. Temperatures during the winter months will often fall below freezing, not the most ideal conditions for trekking. The table below sums up everything nicely for you! When is the best time to visit Morocco’s coastal region? Morocco features two coastlines – one being the Mediterranean, the other being the Atlantic. Rabat, the capital of Morocco, is situated on the Atlantic coast and features a Mediterranean climate, just like the other coastline. Temperatures are mild to warm all year round. The months of July and August bring temperatures of around 27°C and no rainfall at all, meaning that they’re the hottest and driest months of the year. The coldest month is January, with minimum temperatures of 8°C during the night and averages of around 17°C during the day. The best time to visit the coastal region of Morocco would be the months from April until November. You’ve got lovely summer temperatures, little rain and up to 10 sunshine hours a day. The perfect conditions for a beach holiday! When is the best time to visit the West Sahara in the south of Morocco? The territory of the West Sahara was largely annexed by Morocco following the departure of colonial powers. As you’d expect from the Sahara Desert, the climate is very dry with barely any rain. It’s only the months of September and December that really experience any substantial rain. Temperatures during the day hover between 21 and 27°C across the whole year. Nights cool off to their lower in January, with nighttime temperatures of 13°C. Between the coastal area of the West Sahara to the deserts in the south, you’ll find some variations as well. The coast is a little cooler and brings a little bit more of humidity with it too, while the central area of the West Sahara is extremely dry and reach temperatures of up to 40°C – head protection is a must! Sometimes trade winds in the north will bring sandstorms with them, heating things up even more. The best time to visit the coastal region of the West Sahara is between April and November, while the best time to travel to the inland region of the West Sahara would be from October to April. When is the best time to visit the Atlas Mountains? The Atlas Mountains are a popular destination for hikers, adventurers and lovers of the outdoors. If you want to climb some of the peaks there, you should keep your eye on the weather conditions as it rains a lot more in the Atlas Mountains compared to other regions in Marrakech. The reason for this is that the Atlas Mountains are where the two climates of Morocco meet. Temperatures in the Atlas Mountains are lower compared to other areas in Morocco and it’s not uncommon to find snow once you’re above 1,000 metres. If you’re considering doing a tour of the Atlas Mountains, I’d recommend going during the months of March, April, May, October and November. Morocco really is a lovely place to visit thanks to the warmer climates, even during their winter! There are of course variations depending on the region you ultimately go to, but I would say that the months of April and May as well as October and November are the best months to visit Morocco, especially if you’re wanting to go the whole hog with desert tours, camel rides and so on. If you’ve got your heart set on a particular destination, then definitely take a look at the table at the top of the page where I’ve given an overview for each region. Marrakech tends to be the most popular destination for us Irish, so I’ve included a button to my most recent deals below. Enjoy! Browse my most recent Marrakech deals! Check out these amazing places to get away to in Autumn! Discover the country's top sights with my handy guide!